ETF Global: Registration Closing - Spring 2017 ETF Global® Portfolio Challenge! 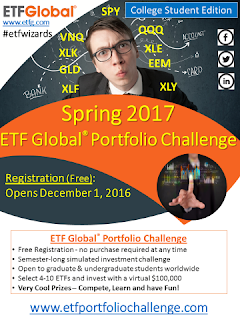 Registration Closing - Spring 2017 ETF Global® Portfolio Challenge! Join the students from over 250 schools who have played and don't get left out of the largest virtual investment contest of its kind! Each student constructs their own virtual portfolio of between 4-10 ETFs and competes on the performance throughout the school semester. Any and all Undergraduate and Graduate students can register - sign up today!